If you're my Facebook friend, you've probably already seen many posts and even a few photos of my Psy experience yesterday. It's true... 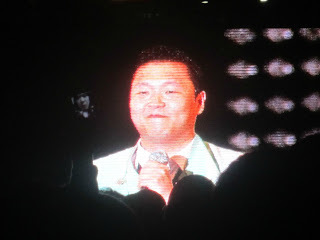 I went to a free concert "in the park style" with Psy! 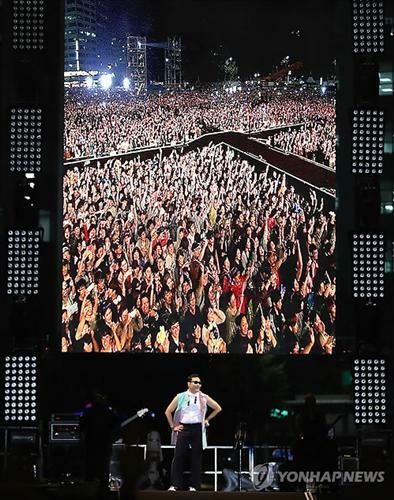 According to articles released today, there was over 80,000 people there. I totally believe it. It was insane!!! Wednesday night, Tab FaceTimed me and told me about it. We decided to go after work, and meet at City Hall. At work yesterday, some of my coworkers were talking about it, so I decided to go with them and meet up with Tab. When it came down to quittin' time, only 3 of us ended up going. It's still a stressful time at work, so Erin and Brian stayed to finish up some report cards. Sean and I headed to the subway. We were meeting my other coworker, Casey, and also Tab at Exit 5. Well, when we got off the subway, I could see we were going to have an interesting time. It was bottle necked at each staircase and you literally had to throw some elbows to get to the exit stalls to scan out. Of course, Exit 5 was on the complete opposite end of the subway, so after about 15 minutes of walking, we realized that Exit 5 was actually closed. My phone had died, so I sent Sean to meet with Casey (having received one last text before my phone kicked the bucket, saying she was at a different Exit). I decided to wait for Tab since she didn't have a phone. After about 25 minutes of using CIA-level face-detection with my eyes, I finally spotted her making her way through the crowd. 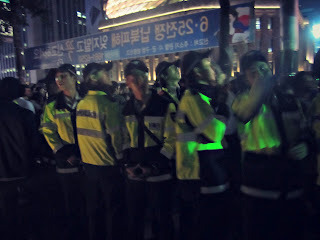 When I was waiting, at first they had closed off the area to where people could only get through thru 1 tiny space, so it was easy to scan people. Then, after about 15 minutes, they opened it up again and the masses came through. It was extremely exhausting trying to take in faces, colors, and body types of each person passing by to make sure Tab didn't accidentally go past me and not see me. When I found her, I was so relieved. We made our way out the Exit which was now open, and into the crowds. It was absolute madness. A zoomed in shot of the screen we were near. Tab had the brilliant idea of "let's get close to the screen" (there were 2-3 screens set up for viewing in the back, since it was so huge; literally city blocks deep). So we plunged into the crowd. Now, I'm not really a fan of crowds, and when you give Koreans the opportunity to see their No.1 national superstar in person, they get a little rough. I got stepped on, shoved past, elbowed, slammed into, nearly nailed in the face, and (I'm convinced) almost trampled. (That last one might be an exaggeration, but not much.) After a few minutes, we decided it was not worth it. We headed back to where there was a small "hole" and hung out there for a few minutes. Suddenly, a human wave crashed into us, sending us reeling back. Had I not grabbed Tab's hand, I think I may have lost her. We were pushed back 50 yards at least, and when I turned my head to see what was going on to push us so far with so much force, of course I saw the police. They had batons horizontally, shoving people back with them. 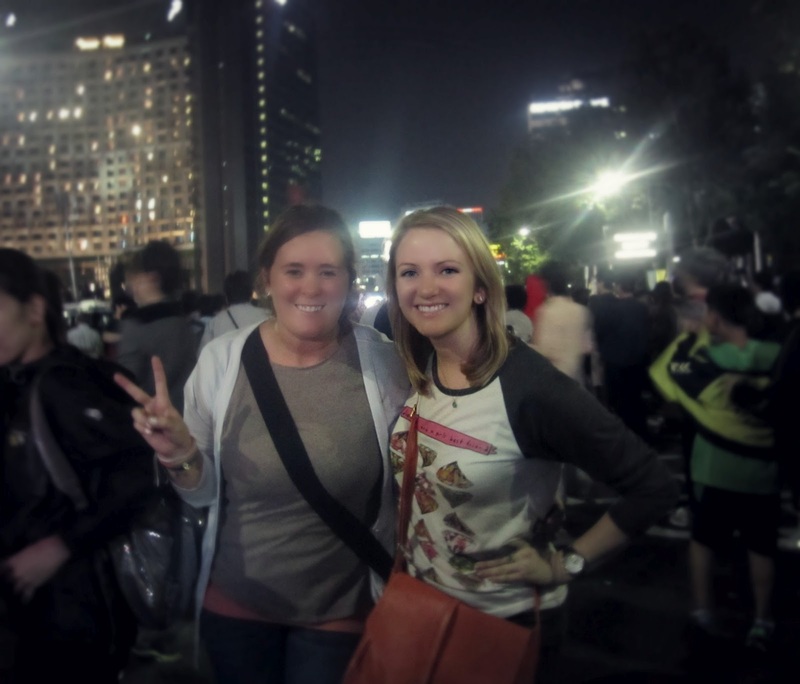 Visions of riots in the streets and tear gas popped into my mind. Thank God this wasn't some political rally, and I didn't think we would be subject to that kind of abuse. Finally we had some room to breathe! When we finally made it to where the crowd cleared, we (wisely) decided to stay in the back. We got a snack of these little dough balls (I can't figure out what they were called, but they were awesome) and some water and chatted with some other foreigners. 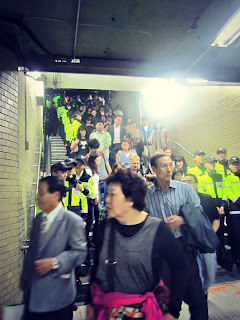 We made our way around the outskirts of the crowd, near to another subway exit. We had just decided "if he doesn't play Gangnam Style in the next 10 minutes, let's go" when luck had it, he played it. The roar of cheers rippled from the front near the stage all the way back, through 80,000 people, to us in the far reaches of the crowd. Literally everyone around me started singing. I videoed this epic moment in my life, but it's so hard to upload videos to this blog. Suffice it to say it was awesome. As soon as the song ended, I pulled Tab toward the subway. 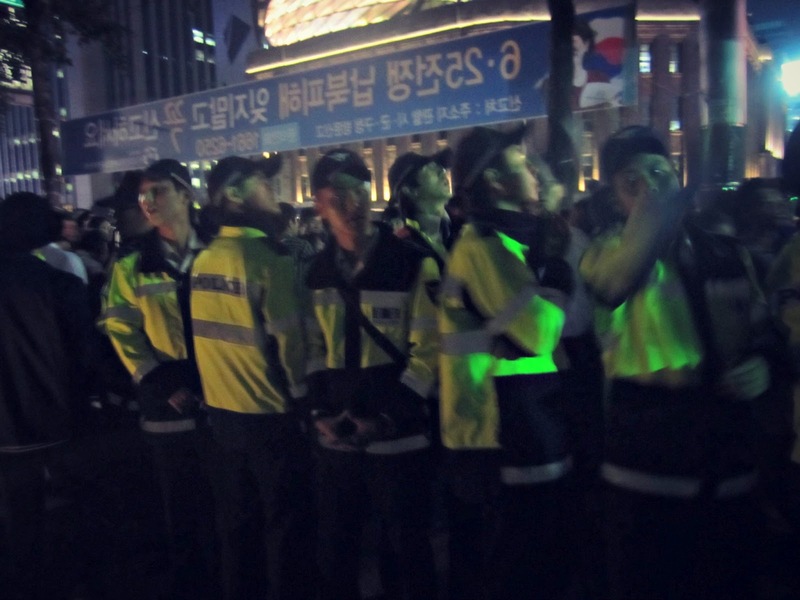 We saw lines upon lines of police lining the streets and the subway. Everyone in yellow in the two pictures below were cops. As soon as we headed down, we saw that probably the rest of Korea had been waiting for that song too, and had decided to leave at that moment as well. 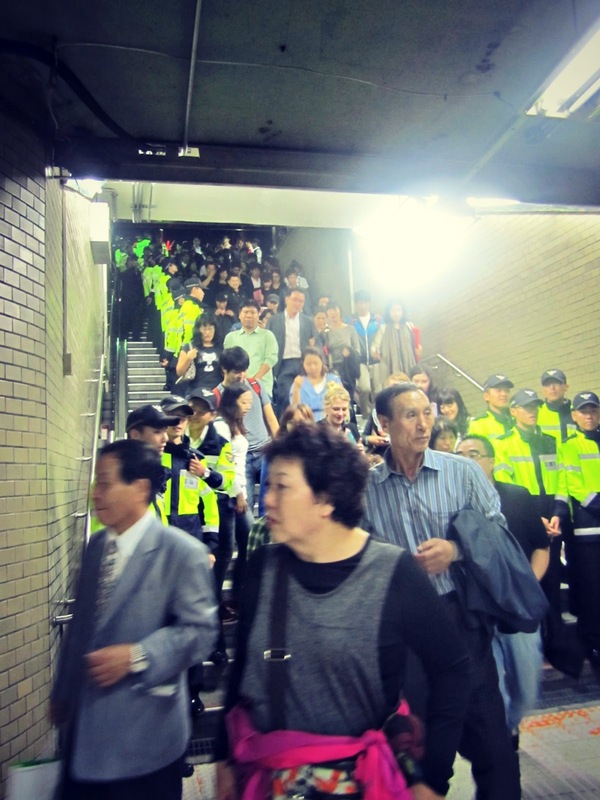 Again we were shoved into the masses of people, pushed around and stepped on attempting to tunnel our way down to the subway. I meant to ask you about Psy and if you'd seen Gangnam Style while we were on skype. I guess this answers my question, lol. It was good to talk to you and see you.